Deep Creek Lake Art & Wine Festival! Art & Wine - what a great combination! 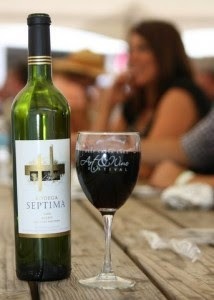 Come out on this Saturday for the festival wine event and shop great artists booths and taste some yummy wines! The Deep Creek Lake Art & Wine event is a multi-day event, but the large festival and tasting part is on Saturday, Sep 6th from 12-6pm! 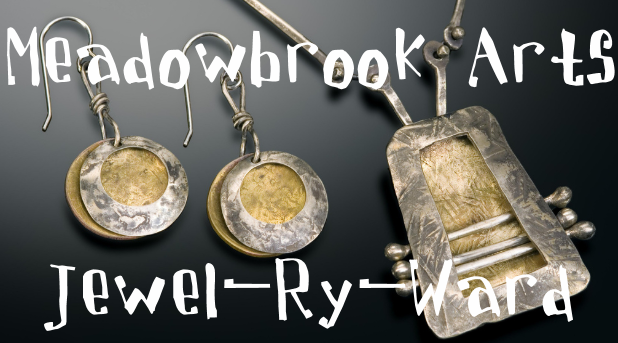 Check out the details at: http://deepcreekwinefest.com/events.php I'll be there selling my jewelry but guarantee I'll go home with a few bottles of wine and even hope to do a little early Christmas shopping! Come out and see me at my first festival of the season! 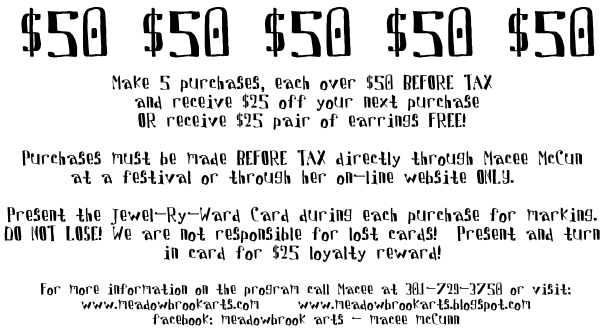 I'll have some new and fabulous jewelry to show you. This is a wonderful event, full of beautiful art & artists! 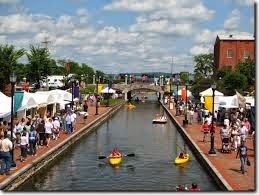 The 21st annual Frederick Festival of the Arts is a juried, three-day fine arts festival held the first weekend every June along Carroll Creek Linear Park in downtown Frederick. The event features over 110 artists from across the country, two stages of live entertainment, artist demonstrations, children’s activities, food, and much more. Saturday, June 7, 2014 – 10:00 a.m. to 6:00 p.m.
Sunday, June 8, 2014 – 11:00 a.m. to 5:00 p.m. These activities are free and open to the public. Saturday, June 7 from 10 a.m. – 6 p.m.
Sunday, June 8 from 11 a.m. – 5 p.m.
• Paper Mosaics: Create colorful designs using paper tiles and shapes. • Paper Roll Art: Create kings and queens and other figures using paper rolls; embellish with colorful fabric pieces, construction paper, and yarn. • Make-Your-Mark Mural Project: Express yourself! The Frederick Festival of the Arts is proud to present this years stellar Entertainment at the FFOTA Main Stage!